A group of Stevie Award winners on stage accepting their award. More than 2,100 nominations from organizations of all sizes and industries were evaluated in this year’s competition. Winners were unveiled on Friday night at a gala ceremony in Las Vegas, Nevada attended by more than 500 executives from around the world. Grand Stevie Award winner Marriott Vacations Worldwide was incorrectly named as Marriott International, Inc. in the original release. 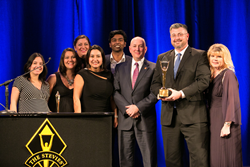 Grand Stevie Award Winners in the 10th Annual Stevie Awards for Sales & Customer Service were revealed on Friday night at a banquet ceremony in Las Vegas, Nevada attended by more than 520 Stevie Award winners and their guests from around the world.